We are your source for prompt, cost-effective electrical services, 24/7. From electrical service work to new construction, remodels and electrical wiring, we do it all, and we do it all extremely well. No matter the project, rest assured we will get it done with precision and efficiency. As a full-service electrical contractor, Speedy Electric and AC is able to offer residential and commercial electrical services which means we can tackle any project big or small. We take care of all of the permitting and inspection processes so you have one less thing to worry about. We do electrical repairs, remodels and new installations for all types of locations including residential, commercial and industrial. Our electricians perform installations, emergency repairs and facility maintenance 24/7. Serving Midlothian, TX and surrounding areas, Speedy Electric & AC is fully licensed, bonded, and insured for your protection. Call us anytime to schedule your appointment with an electrician. We strive for 110% excellence in all of our work. Speedy is always up front about what it will take and what it will cost to get you back up and running and are always willing to take the time to explain everything to the fullest extent. We are passionate about what we do day in and day out and build with integrity. Every electrical services project has its challenges and we are always eager to overcome them. We will work hard for you just as we would on our own homes and businesses. We look forward to working for you! Electrical work is a delicate matter. If it is not done correctly, it can cause extensive problems, serious safety concerns, costly repairs, and much more. That is where we come in. Our electricians are fully insured and bonded for quality repairs. 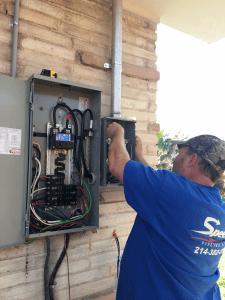 Speedy Electric & AC services Midlothian, Cedar Hill, Red Oak, Waxahachie, Mansfield, Arlington, Duncanville, Grand Prairie, and the entire Dallas – Fort Worth Metroplex. Call us today at 214-382-0780 to schedule an appointment!